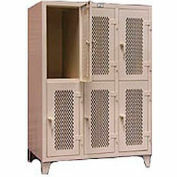 Strong Hold® All-Welded Double Tier Personal Lockers Features Extra Heavy-Duty Battleship Construction for Lifetime Durability! 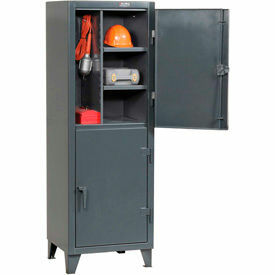 Sturdy lockers constructed of heavy-duty, 12-gauge steel to handle your personal and work storage needs. One piece body features an attractive wrap-around design. Three-point locking device is designed for use with a heavy padlock for increased security. Each opening has two 14-gauge adjustable shelves with a capacity of 775 lbs. each. Shelves attach with 3/8" carriage bolts. Legs allow six-inch sweep space underneath. Flush bottom made of 12-gauge steel. Durable, dark gray electrostatically painted finish. 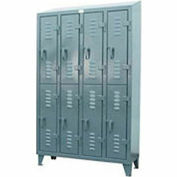 Double tier lockers are for use in all types of work environments. Lockers are designed. 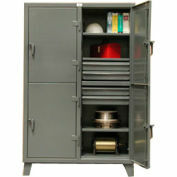 21-1/2"W locker is subdivided into 4 compartments. Shipped assembled, ready to use.